Ausharea Adams, from Warner Robins, Georgia, has concentrations in photography and drawing. Adams, who also does performance art, participated in the Anthony Braxton collaborative installation and concert at the Dinah Washington Cultural Arts Center in 2015. Her artist statement, part of the research process for all BFA candidates, reveals the relationship between her two areas of concentration as well the physicality of her work. In an excerpt, Adams writes: “My work is an exploration of the residual marks created by the presence and absence of light. Light and dark rule my every day…My work is an exploration of the residual marks created by the presence and absence of my body. My body rules my every day. It is in chronic motion, constantly informing and reshaping how I perceive the world around me as well as myself.” Adams’ art can be seen on Facebook here. After she graduates, she plans to relocate to Birmingham and become very active in that community while keeping close ties with Tuscaloosa. Originally from Cincinnati, Ohio, Tanika Powers writes that her work is inspired by her everyday life: “Through painting and printmaking, my work is produced by what happens when I am myself, [when I] try new things.” Powers’ art focuses on her encounters with the body and is a commentary on society’s ideas about female sexuality. 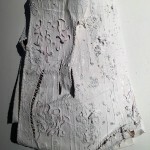 She emphasizes that, “the medium is just as important as the subject. In life, and so in art, I try to experiment, which helps me create process-driven works that have aesthetic pleasure.” She plans to go to graduate school in art after taking a year off. Haylee Walker, whose concentrations are printmaking and digital media, creates work based on her mood and interests. Highly influenced by her inner world and surrounding environment, she says, she draws inspiration from her daily routine, her peers and her travels. Walker’s print, “Subway Rat,” was accepted to the 2016 Delta National Small Prints Exhibition at Arkansas State University in Jonesboro, juried by Dennis Michael Jon, associate curator of prints and drawings at Minneapolis Institute of Art. Walker, a senior BFA major, is from Pelham, Alabama. 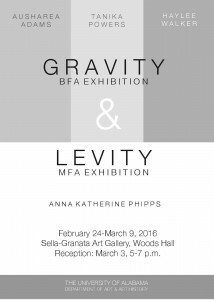 Tanika Powers and Ausharea Adams participated in the 2015 BFA Juried Exhibition. Participants in the 2016 BFA Juried Exhibition, in April, will be announced in the coming weeks. Some people who will be attending the reception on Thursday, March 3, have sensitivities to various chemical-based or scented products. We ask for everyone’s cooperation in our efforts to accommodate their health concerns by refraining from wearing heavily scented perfumes and other products. Thank you. The Bachelor of Fine Arts degree is the professional degree for the artist; it is also the foundation for the masters program in studio art at UA. For more information about the BFA degree and our other degree programs in the Department of Art and Art History, go to http://art.ua.edu/academics/undergraduate-programs/babfa-in-studio-art/ or contact the department at (205) 348-5967. Funding support for the Sella-Granata Art Gallery comes from the Department of Art and Art History and the College of Arts and Sciences. Admission to the gallery is free. Hours are Monday through Thursday 10:00 – 4:00 p.m. The gallery is located at 109 Woods Hall in the heart of the UA campus on Woods Quad. Information about visitor parking is available here: http://bamaparking.ua.edu/visitor-information/. Parking is free on campus in a legal space after business hours. 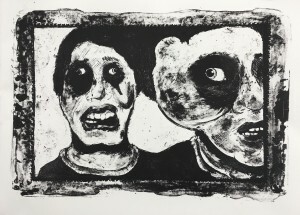 For more information, contact the gallery at (205) 348-2783 or go to http://art.ua.edu/gallery/sgg/.